Are you tired of your old blog and find it too much trouble to maintain? Here’s how you can get a fresh new start with a new, free Tumblr blog. Whether you’re an entrepreneur and want to share your latest products with the world or a mom with parenting tips to share, chances are you have a blog or have considered starting one. Blogs are great to share your thoughts and favorite things with the world, but most blogging systems can be cumbersome and difficult to manage. Tumblr is a different take on blogs. It is built around the concept of sharing what is most important to you, and makes it very easy to post pictures, videos, quotes, links, and even traditional blog posts. It takes the work out of blogging, and lets you focus on your content. 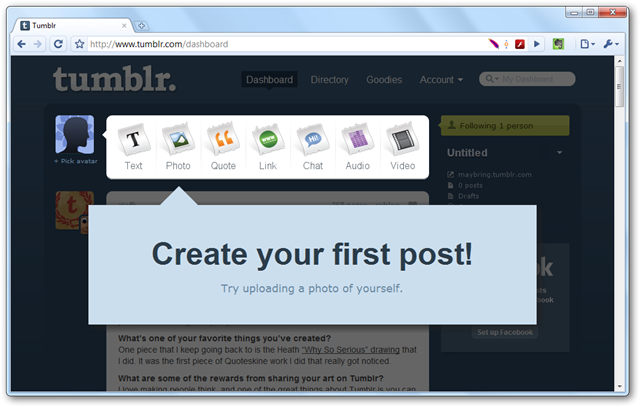 Let’s take a look at how you can create a Tumblr blog for free. Signing up for a free Tumblr blog is very simple. 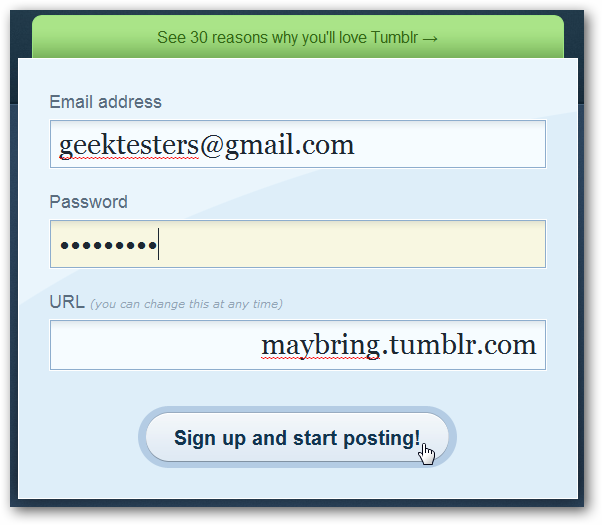 Head over to Tumblr.com, and simply enter a username, password, and URL for your new blog. Note that the address for your new blog will be your_blogname.tumblr.com. Don’t worry about finding the perfect name; you can always change it in the future. Click Sign up and Start Posting when you’re finished. 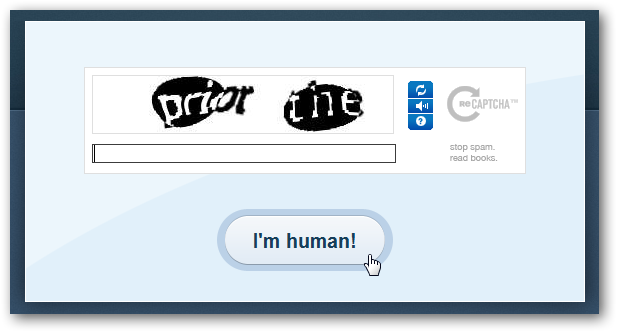 You’ll be asked to confirm that you’re a human by entering a Capatcha. Enter the text in the image, and then click I’m human! Now, you’re ready to start posting. Two clicks, and you’re already done! 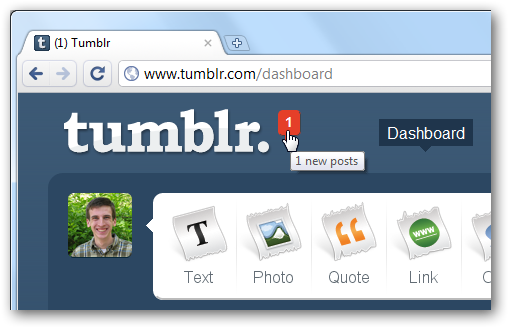 Select one of the icons along the top of your Tumblr dashboard to post whatever you want. 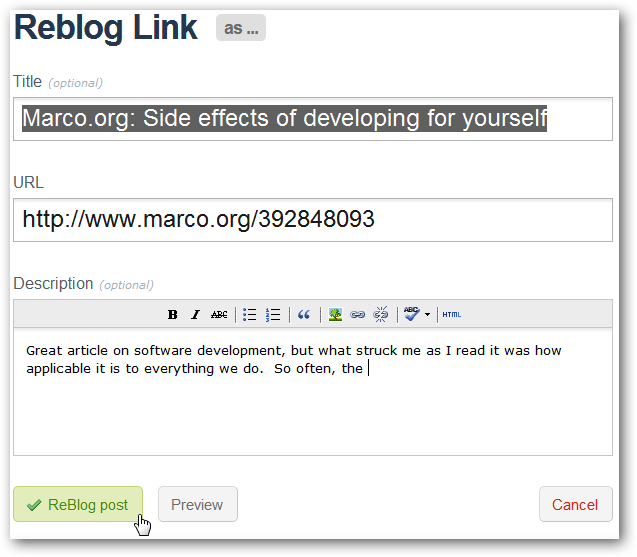 You can post a photo, quote, link, chat, audio, video, or even a text blog post. The editor is simple to use, and gives just enough tools to make it easy to post like you want. Standard keyboard shortcuts for bold, italics, and more work as normal in the online editor. Click Create Post when you’re ready to publish your thoughts to your blog. 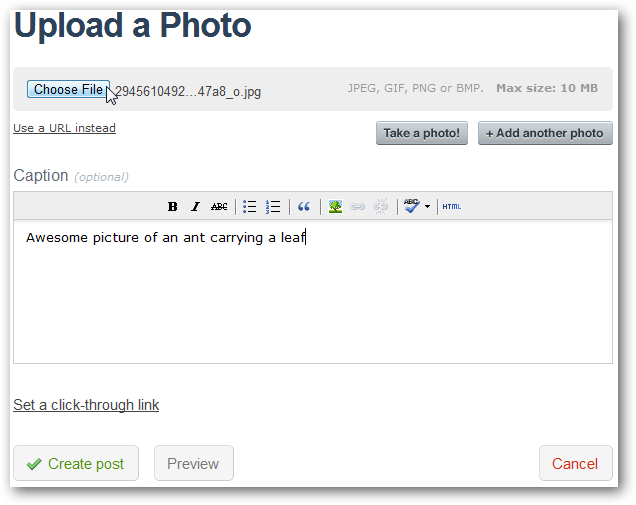 Posting a picture is similarly easy; click Choose File to upload your picture, and then add a caption if you wish. Alternately, you can post a link to an image, and it will show up, or you can even take a photo from your webcam. We especially liked the Link post option, which makes it easy to share interesting articles and websites and add your own input about them. 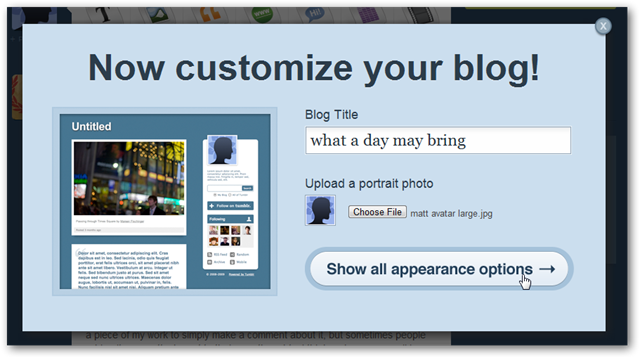 Once you’ve created your first post, Tumblr will prompt you to customize your blog. Enter a title, upload a portrait of yourself or a logo for your blog if you like, and click Show all appearance options for more customization options. 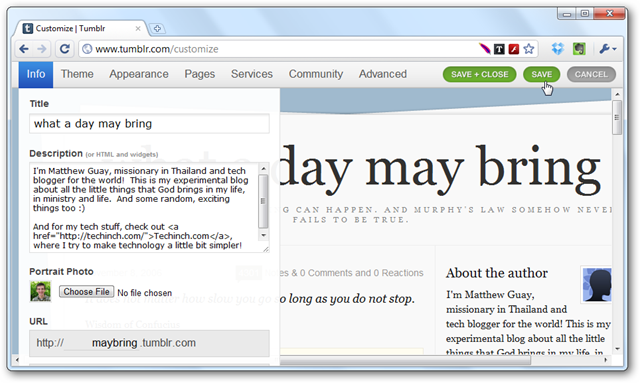 Here you can easily change your blog’s title, description, theme and more. Change anything you want, and then click Save in the top right corner. 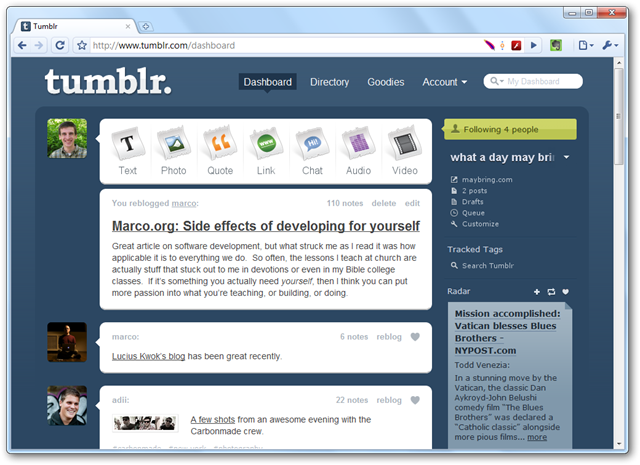 Tumblr offers dozens of beautiful themes, including free and premium ones. Select a theme to preview it on the blog preview below. We’ll be showing you more tricks and tricks on customizing your Tumblr in an upcoming post, so feel free to experiment and come back for that. As you may notice, your Tumblr Dashboard shows other posts underneath your posting buttons. These are recent posts from Tumblr blogs you follow, so by default you’ll see posts from the Tumblr team. Click the heart to show you like a post, or click the notes link to see who else liked a post. If you want to read older posts, scroll down and Tumblr will automatically load them. Whenever you’re reading a blog that’s powered by Tumblr, you’ll notice buttons on the top right. Click Follow to see their recent posts on your Tumblr dashboard. Or, if you really like a post, click the Reblog link. 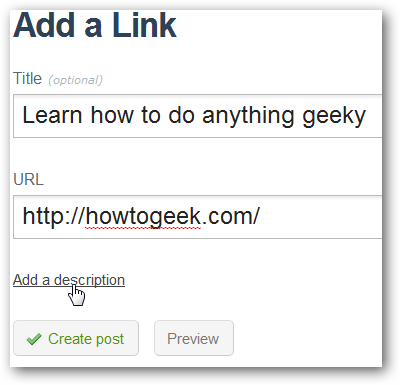 This will open a window where you can post a link to the post on your Tumblr blog, and you can also add comments or extra info in the Description field if you want. If one of the Tumblr blogs you follow posts new content while you’re on your dashboard, you’ll see an update beside the Tumblr logo. Refresh the page to see the new posts. The Tumblr Follow system is like a blend between RSS feeds and following someone on Twitter, and we’ve found it very easy to use. If many of your friends and colleagues are using Tumblr, you may find yourself heading to your Tumblr dashboard to find out what’s going on. But even if you only want to post yourself, the Dashboard still makes it easy to post whatever you want. 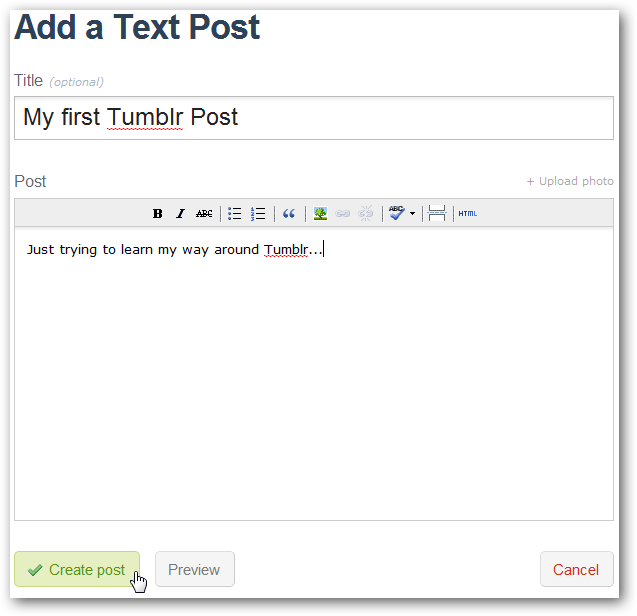 Whether you want to share your pictures or practice your writing skills, Tumblr is a great option for blogging. We’ve found it much easier to use than other blogging systems, while still looking nice with advanced features. 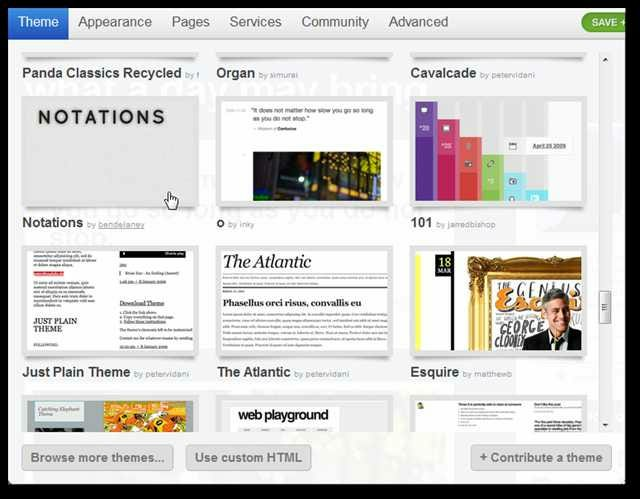 While WordPress edges closer to being a full blown Content Management System, Tumblr is back at the origins of blogging, helping users post what’s most important to them. Come back for more Tumblr content soon, as we’ll show you how to customize your Tumblr blog, share your content with the world, and more! 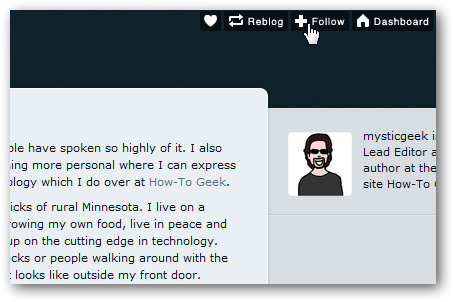 If you want to get an idea of what you can expect from Tumblr, several How-To Geek team members have Tumblr blogs. Not all of them have been updated recently, but you’ll get the idea.